It is a clear cut fact that every retail shop needs a retail software or a POS software to run its business. But, while getting a retail software, what are the things that you seek? And what should you be seeking for? From supermarkets to restaurants, the basic need is a billing software, but what are the things that are needed specifically to ease in management and operations in your retail shop? Let’s discuss. Compatibility: For any kind of retail shop, the software you purchase must be compatible with the kind of machine you are already using. Choosing software which is compatible with PC, Laptop and tablet should be considered. Inventory: A good POS or retail software must have a section to manage, update and record your inventory. Going out of stock isn’t an option in 2019. You can also have an alert when the stock of a product goes down below a specific amount. Integrable : Well, you can’t afford to have different software for accounting, inventory, sales, payroll etc. Hence, a single system which can occupy everything you need to have is a must. This will help you track your business. CRM : Nowadays, feedback from the customer is the ultimate form of reward you can get in retail marketing. Keeping a Track of customers along with having details of them to create proper royalty programs and discounts and letting the customer know you remember them can boost up your sales in the generation X and generation Z cultures. Safety : Now, integrating everything onto a single platform, although decreases efforts, but at the same time risk everything you have. And don’t forget the most precious thing you have, the customers data. All of these things including details of employees, your sales records, your account details all must be super confidential along with levels of access. GUI : You can’t afford to train your employees for a month on a technology which is hard to master. Neither you can hire trained professionals for it. Hence, the user interface is considered one of the most important features to choose while selecting a retail software. Easy, catchy and understandable are the keys to it. Reports : Nowadays, the competition is so big that you have to plan based on your past experiences with your customers. More than half of the customers in shops are repeat customers. Having intelligent reports based on your sales and predicting future sales of products and services you are offering can help your business grow exponentially. Customizability : Almost all of the companies based on retail software solutions are giving customization for your POS or retail software system to make your business run in your own way. 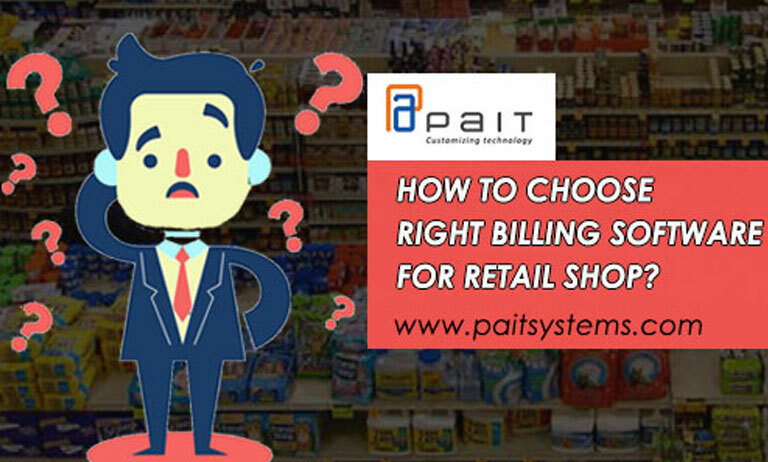 PAIT BIZ Pvt Ltd, a retail software solutions provider and hardware AMC company brings you one of the finest set of experienced professionals who will help you choose the correct POS for your business and also suggest you what you need to be the best in your contemporaries. In the end, it’s all about winning the race to the heart of your customers.